There are 15 players left in a big buy-in tournament, but only eight will make the money. You are currently in second place with 1,267,000 in chips, with blinds of 6,000-12,000 with a 2,000 ante, giving you 105 big blinds to work with. A player with 457,000 opens from middle position to 28,000. You look down at A Q in the small blind and three-bet to 80,000. Your opponent calls and the flop comes down A Q J . You bet 75,000 and your opponent calls. The turn is the 3 . 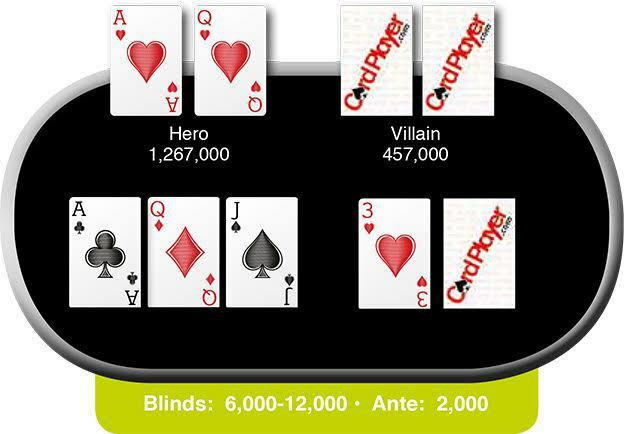 Your opponent currently has 300,000 left in his stack and the pot size is 336,000. Do you check or bet? If you think you are ahead, how do you extract value? If you think you might be behind, how do you minimize your losses? Given your opponent’s line, what hands are in his range? There aren’t many draws on board, so are you worried about protecting your hand? How can you best disguise the strength of your hand? If moving all in, can you ever get called with worse? What worse hands would pay you off? At the WPT Philippines $200,000 Triton Super High Roller Cali Cup in Manila, Mike McDonald opted to move all in holding A Q on a board of A Q 3 . His opponent, Devan Tang, immediately called all in for his last 300,000 with A A for top set, leaving McDonald drawing dead. The meaningless river card was the 7 and Tang doubled up. McDonald went on to min-cash in eighth place, earning $351,320. Tang earned $1,405,500 for his third-place finish. 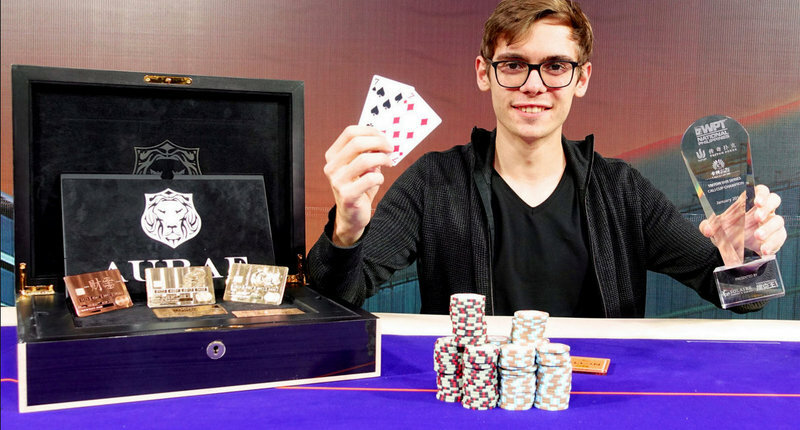 The eventual winner was Fedor Holz, who took home a career best $3,463,500. Its a cold deck, even the 3 on turn is cold. Makes no difference what he bet or did on the turn. He can't slow play and must bet at least something in case player has AK and don't want to give free card. Also because he has AQ, a set of aces or a set of queens is unlikely. Its just a bad spot to be in and is a cooler. Lets say he opts to bet 100k on the turn. AA will now be thinking the same thing and either go all in for 200k more or just slow play. River is a blank. Well played hand by AA is bottom line. The key play is AA smooth calling pre-flop. Not that it would have mattered, but I would have bet more on the flop. 75K seems too small - less than 1/2 pot. 1. Underpair to the board - no real prospects of getting any more chips if this is the case. 2. Hit a piece of the flop - something like KQ or AK. In this case there are draws that can get there and hand should be played fast to either get the money in while ahead or to end the hand. 3. Something that beats AQ - a set or KT for the straight. No way to get away from the hand if that's the case. Given the way the hand was played, I would put opponent all in on the turn. No point in letting a draw get there without getting the money in first. I would be a bit concerned - but there is nothing to do about it.